Bösendorfer Defined the "Viennese Art of Piano Making." Vienna, 1828: Ignaz Bösendorfer obtained a business license to start his own piano manufacturing company; Franz Schubert died on November 28th and, at his request, was buried next to Ludwig van Beethoven who had died a year earlier in Vienna on March 27th. Before them, this city on the Danube was already home to Mozart and Haydn. By 1828, young Franz Liszt [1811-1886] had already established himself in Vienna as a concert pianist. Earlier his family had settled in Vienna, circa 1823, where Franz studied the piano with Karl Czerny. By age seventeen, Franz Liszt had developed a reputation for wrecking nearly every piano made available to him for concerts due to his impulsive, often bombastic and heavy-handed, playing technique. But even Liszt’s most critical observers had never witnessed such power and skill at the keyboard. Upon the advice of several friends, Liszt tried his demanding concert pieces on a Bösendorfer grand. The piano held up under Liszt’s rigorous test, and passed with flying colors! 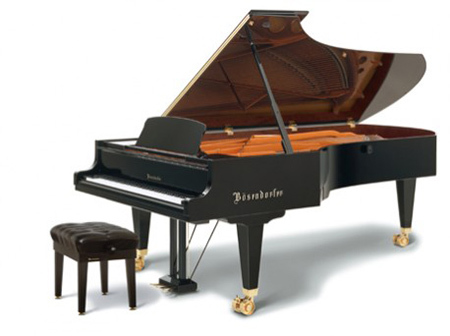 At a “single blow,” the name of Bösendorfer became synonymous with concert grand performance, durability, touch response, and sustained tone quality. 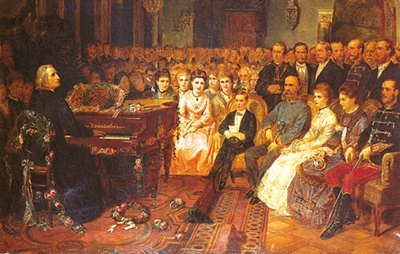 Franz Liszt playing for Emperor Franz Josef. In 1830, the Emperor of Austria named Ignaz Bösendorfer “Imperial and Royal Piano Purveyor to the Court” ― the first piano maker to be granted this honor. Numerous gold medals and first prizes followed. 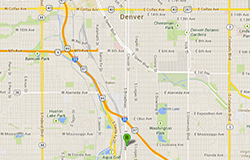 Bösendorfer pianos have been linked intrinsically with musical culture since early beginnings. For over 40 years, up to just before the First World War, Bösendorfer Hall was the most frequented concert hall for chamber music in Vienna, due to its outstanding acoustics. Over 45,000 concerts took place, by such luminaries as Anton Rubinstein, Franz Liszt, Eugen d’Albert, Johannes Brahms, Ernst von Dohnány, Max Reger, Arthur Rubinstein, Béla Bartók, Edvard Grieg, Gustav Mahler, and Richard Strauss. At the end of the 19th century, Bösendorfer pianos were built for the imperial court, Empress Elisabeth, Empress Eugenie of France, the emperor of Japan, the czars of Russia, and other prominent personalities. More than three decades have passed since Steinway & Sons, New York, punished American concert pianist Garrick Ohlsson for endorsing a rival piano maker in an interview with The New York Times. "It was enormously vindictive," Mr. Ohlsson said about the aftermath of his comment, on the eve of a 1972 Alice Tully Hall concert, that Bösendorfer was "the Rolls-Royce of pianos." 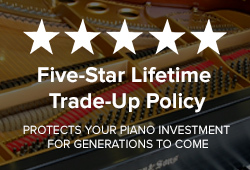 Since 1972, Bösendorfer pianos have continued to win the hearts and musical minds of America’s ― and the world’s ― most prominent artists who play or have played Bösendorfer pianos, as well as personalities who own or have owned a Bösendorfer instrument. Partial Roster Includes: Vladimir Ashkenazy, Wilhelm Backhaus, The Beatles, Leonard Bernstein, Dave Brubeck, Plácido Domingo, Philippe Entremont, Richard Gere, Emil Gilels, Anthony Hopkins, Herbert von Karajan, Jack Lemmon, Valentina Lisitsa, Lorin Maazel, Garrick Ohlsson, Oscar Peterson, André Previn, Sviatoslav Richter, András Schiff, Arnold Schönberg, Frank Sinatra, and Stevie Wonder. 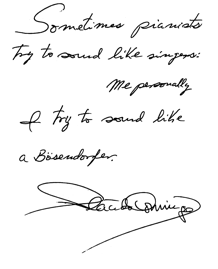 me personally I try to sound like a Bösendorfer." Marketing hype should never pre-program the serious pianist regarding brand names prior to audition. 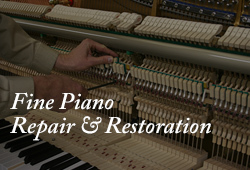 Preferences between pianists for one piano manufacturer or the other are as personal as love, romance, and marriage. A noble instrument can literally “win your heart” upon first playing it, as with love at first sight. In the final analysis, it’s all about communicating emotion from the keyboard — discovering that one-of-a-kind piano as your partner and friend; an instrument that will become a “living part” of who you are and what you want to become. Meanwhile, enjoy some performances by the brilliant concert pianist, Valentina Lisitsa.